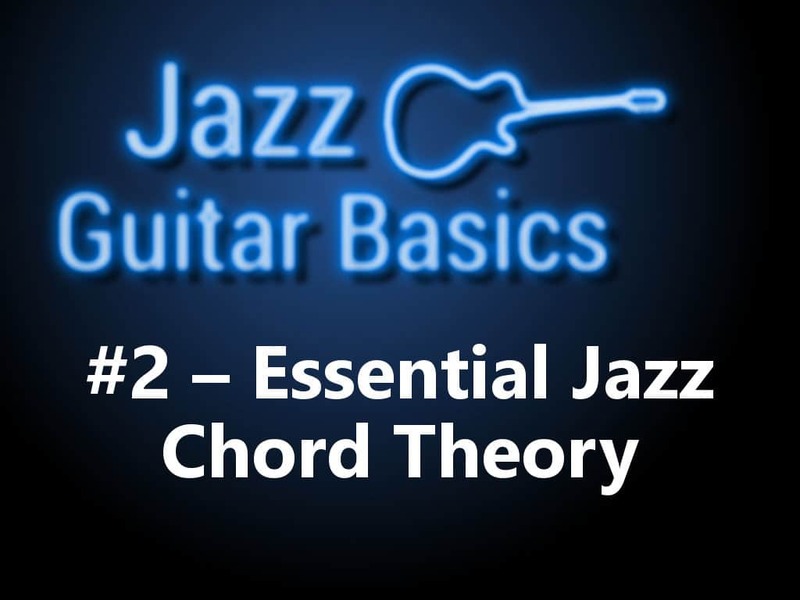 Knowing the theory about jazz guitar chords is essential to becoming a competent jazz musician. I’m going to tell you the basic theory you need to know to understand chord progressions and why certain chords sound good together. However, I’m not going to run wild on the theory, because I want to keep it practical. In article #1 I introduced the 4 chord tonalities that are most common in jazz music. Here they are again. Now let’s learn WHY those chords are important to know. Let’s take a look at this C Major Scale below. I’m using the key of C Major, because there aren’t any sharps or flats to deal with. This makes it easier to understand. Just so we’re clear, the notes here, in order, from left to right are C, D, E, F, G, A, B, and C. Each one of those notes are “diatonic” to the key of C Major. The word “diatonic” just means that it “belongs to” whatever key you’re playing in. Let’s do something cool with these notes. Let’s form chords with them by stacking every other note on top of one another. So instead of playing a C and a D at the same time, let’s play C and E. After the E let’s add a G, and a B. This interval of every other note in a scale is called a “diatonic third.” So if we continue to “stack diatonic thirds” on top of one another we end up with a full chord. For triads, you need 3 notes, but this is jazz so we use 4 notes. These are called “seventh chords” because they include the 7th interval away from the root of a chord, unlike triads, which only contain a root, a third, and a fifth. A seventh chord contains all three of those notes but adds the 7th. Here is the chord that is formed by stacking 4 notes, that are diatonic thirds away from each other, with a root of C.
This particular “formula” of a chord creates a Major Seventh chord. Chord construction and formulas are a large topic outside the scope of this article, however here are some simple rules you need to know. Chord quality is determined by the combination (formula) of note intervals it contains away from the root note. The third and seventh of a chord are known as the “guide tones” of a chord. They are the notes the define the chord’s tonality. A diatonic third can either be a Major 3rd or a Minor 3rd. This is dependent on how the notes fall according to the scale. A Major 3rd, in a chord will always create a major or dominant chord. A Minor 3rd, in a chord will always create a minor, half-diminished, or fully diminished chord. As you can tell the third is an important interval. Take a look at the table below and memorize the formulas of these chords. Now that we’ve covered some chord construction theory, let’s get back to stacking thirds and making chords. If we do what we just did, but stack thirds on top of a D note, here’s what we get. We get a minor seven chord because the diatonic notes of the C Major Scale create the formula necessary for that type of chord when we start on the 2nd “degree” of the scale, which is a D.
Here’s what all of the chords look like. Here are the chords you create for each degree, EVERY time you stack four diatonic thirds on top each other in ANY key while using the Major Scale. As you can tell from the table, when we’re talking about the diatonic chord that stems from a scale note, it’s called a scale “degree.” The 2nd scale degree of a Major Scale, always creates a minor seven chord (or minor triad, if we leave off the 7th). The 5th degree of a Major Scale always creates a dominant seven chord (or major triad, if we leave off the 7th). Have you ever wondered why certain chords sound good together and others don’t? The topic of diatonic harmony (the concepts you’re learning in this article) answers that question. Only specific chords sound good with other specific chords because the notes must be taken from the scale of the key you’re playing in. This is valuable information because it gives you the ability to write your own songs, and chord progressions that make sense (whether in jazz, or not). Try playing the C Major Scale on a single string, starting with the 3rd fret, 5th string, but play it with the diatonic chords, associated with each degree. In the key of C Major, the chords would look like this.. In tab, it looks like this. How cool is that? You can now play the Major Scale in chords! This is also known as the “harmonized” scale, or “harmonizing “ a scale. This was using the 5th string root chords. Try the same thing on the 6th string, with another key (F, for example). If you’re going to learn a jazz tune out of the Real Book, you will need to know how to understand the chord symbols. Let’s suppose we are examining an E chord for this example. Here are all the various symbols you will see for the different chord qualities. Learn and memorize these, so you will understand them when you see them. Often times you’ll see chord progressions written in Roman numerals. Here are some rules regarding the Roman numeral chord notation. The Roman numeral shown represents the scale degree that is being played. Lower case, represents minor chords. Upper case represents major chords. Upper case with a 7 after it represents a dominant chord. Some examples of Roman numeral chord progressions would be the I-IV-V (1-4-5 Major Chords), the I7-IV7-V7 (1-4-5, with Dominant Chords), or the ii-V7-I (Minor 2, Dominant 5, Major 1) jazz progression. Let’s look at that more. Although diatonic harmony applies to every style of music, this is a jazz lesson so let’s talk about how it’s used in jazz. Jazz tunes use a certain chord progression very frequently. It’s called a 2-5-1 progression. Written in Roman numeral chord notation, like you just learned above, it looks like this. This is known as a “Major 2-5-1 progression.” In the next article I’ll talk about the Minor 2-5-1 progression as well. Practice playing this progression in many different keys. Take note of how, the chords build tension, then give a release of tension once the I chord is played. Okay, we covered quite a bit of technical knowledge in this article. I have two challenges for you to try before you go onto the next lesson. Play the Major Scale up and down the neck IN CHORDS on a single string. Use all four chord shapes you learned in the last article, combined with the table above of the harmonized Major Scale, and play it using 5th string root chords, and 6th string root chords. Start playing major 2-5-1 progressions all over the neck. I gave you the example of a Dm7-G7-CMaj7 progression. Move over the neck, and try others, such as the Em7-A7-DMaj7, or any others you can think of. Click the button below to see my next article, where we’ll start discussing some of the most famous jazz tunes or “standards” as they are called. We’ll also expand on our knowledge of popular jazz chord progressions. Talk to you then!